maintained a standard of playing which was otherwise unknown in the Soviet Union. The conductor’s reputation and that of his orchestra were widely known throughout the music world. It is not surprising that Mravinsky was entrusted with the premieres of many major works by Soviet composers. Among these were six of Shostakovich’s Symphonies, three of which–Nos. 5, 8, and 12–are included on this video. No. 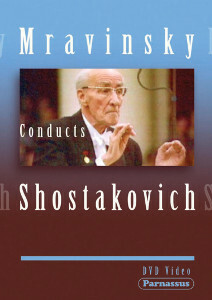 8 was dedicated by the composer to Mravinsky. This conductor and orchestra have been very widely documented on audio recordings. However, their video legacy is very scant. None of these videos has ever been available in any Western country, and none has been available anywhere for decades. Although the video quality of these recordings is limited by Soviet technology of the times, they have been subjected to expert restoration by Chris Andersen of Nevessa Studios. Fortunately their audio quality is highly satisfactory. The discs are not region encoded and should be playable anywhere. Parnassus Records are distributed in the U.S. by E1, in Italy by La Tosca, and elsewhere by alto distribution.